CVViZ Is An Online Recruitment Software That Streamlines Hiring Process by means of Recruitment Automation. It connects recruiters, recruitment vendors, hiring managers and candidates seamlessly. CVViZ uses AI that makes your recruiting process simpler, efficient and Also improves your quality of hire. Build beautiful, informative and impactful career pages instantly. Choose colors, styles, images and create your own company career page using CVViZ’s website career page design module. It seamlessly integrates with your company website and display active jobs. Enrich candidate’s experience with easy click to apply option. Build employer brand with company career page. It helps you attract best talent. Discover and source candidates from various job boards, social platforms like LinkedIn, GitHub, StackOverflow and many other platforms in one go! Using Find On Web feature you could import resumes of relevant candidates from most of such platforms. Experience the power of elastic search. Search anything and everything that exists in your resume database. Elastic search is fast, very very fast. Your relationship with your database changes when you get accurate results in a blink of an eye. Find every information, discover hidden gems in your candidate database. Perform all kind of searches like exact match, multi words search, boolean search and get results in the relevant order. 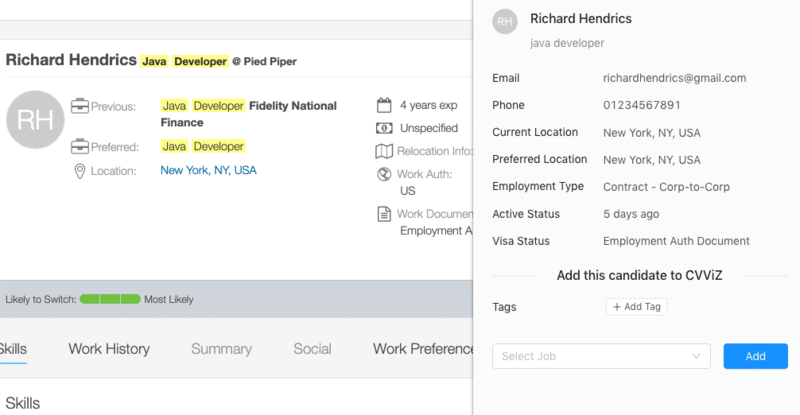 Elastic search can scan thousands of resumes in fraction of a second. Email is the oldest, most trusted and commonly used medium for receiving candidate applications. Use CVViZ email integration that smartly pulls only resumes out of your emails. It directly imports resumes into CVViZ, your candidate database. CVViZ offers a chrome extension that helps you import resumes directly into CVViZ from job boards like Dice, Monster, LinkedIn, etc. It saves recruiter’s time by directly uploading resumes into CVViZ resume pool. It also indicates if resume already exists in your database, hence, avoid duplication. Data driven hiring is important. It means your are measuring your hiring process. Important recruiting metrics help you understand if you are hiring efficiently. CVViZ provides important insights into hiring. Important metrics like Cost per hire, Time to fill, Effective candidate sourcing channels not only help you optimize your recruiting process but it also help you spend wisely. CVViZ offers another AI recruiting solution – a modern AI powered Applicant Tracking System (ATS). It helps you in finding right candidates for the right job, much faster. It is a cloud based online recruitment software that can be accessed from anywhere, anytime. This recruitment automation software seamlessly automates tasks of recruiters and hiring managers. Why just search for resumes when you can also find where they fit best. Automate resume screening using Artificial Intelligence. Store all your resumes in a centralized location over AWS cloud. Access recruitment database anytime, anywhere. Reach to RIGHT candidates on recognized platforms like GitHUB, stack overflow by means of personalized communication. Video interview your candidates. You may also watch developer coding on a live code editor! Attract active and passive candidates by extending your reach on social platforms. Got resumes sitting in your emails. CVViZ imports resumes from your Inbox at a click. About 20% resumes duplicated YoY. CVViZ makes sure you don't spend time on duplicate efforts. Build pipeline for talent acquisition for futures requirements. Our candidate sourcing feature help you source talent from various platforms. Be it a small note or a long conversation you had with the candidate, we make sure it is noted. Integrate your career page with ATS. Don't have active career page? No worries, we generate career page for you and also optimize it for google search. User our various email templates for sending emails to candidates. Miss no action or No going back n forth with emails. Seamless workflow ensures that you get notified on every action.